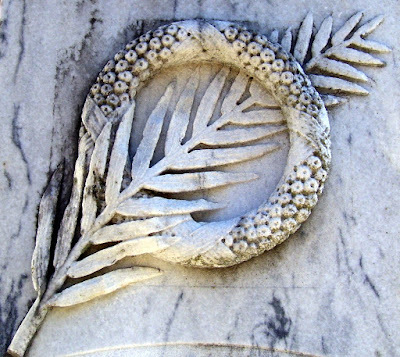 The palm frond, shown through the wreath above, may be seen as a symbol of victory. This is how the Romans used them. Christians adapted them to symbolize an individual's triumph over death. In the instance above, I believe the wreath is another symbol for victory. Usually this would be attributed to the laurel wreath, also representing eternity and immortality. 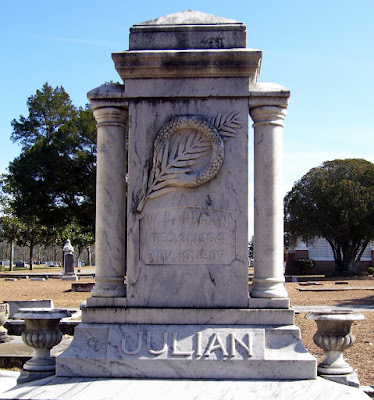 Fitzgerald, Ga., November 14 -- Dr. W. L. Julian fell dead at Rogers' livery stable today. Dr. Julian was a highly respected citizen and worth a considerable amount of money. He quit practicing several years ago to look after his property. He was about sixty years of age, but appeared to be in very good health, except for the last few weeks he was very nervous. He is survived by a wife and three brothers.